Casa do Trovador is set high on the hills overlooking the Castelo de Bode Lake, 13 kilometres from the historic town of Tomar, Portugal. This is a good option for large groups or families wishing to stay in a rural location yet within reach of the town and its famous UNESCO sites. The house can be rented in its entirety on a per-night or per-week basis, or nightly as individual rooms. While not luxurious, the guesthouse is clean and the service pleasant, and what it lacks in visual charm it makes up for with its location, nestled in the verdant hillside with views over the lake towards the Ilha do Lombo and the mountains on the other side. The rooms at the Casa do Trovador feature wooden floors and are pleasantly furnished and decorated with local crafts and artworks. There are six rooms in total all boasting excellent lake and mountain views. Three have private bathroom and bidet and the remaining three sharing two bathrooms between them. All offer, towels, bathrobes and hairdryer and there is free wireless internet throughout the building. Most of the rooms are spacious enough to accommodate an extra bed on request or a baby’s crib. There are two large living rooms, a dining room and an interior garden. A full English breakfast is served each morning when the house is let on a by-room basis and can also be provided when it is rented in its entirety. Otherwise the guests have full use of the modern kitchen, which is fully equipped with microwave, electric hob and oven as well as dishwasher and washing machine. Packed lunches and evening meals can also be prepared on request as long as they are reserved in advance. A bar service is also available serving a variety of soft and alcoholic drinks to guests. 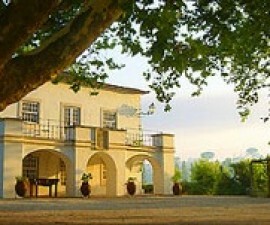 The landscaped gardens make for a pleasant place to relax and enjoy Portugal’s summer sun. There is a good-sized pool with separate hydro-massage pool, plenty of sun loungers and a shaded area where guests can relax on hammocks away from the midday rays. A mini soccer field and table tennis table provide added entertainment for younger guests and there is a barbecue and grill area available for use. 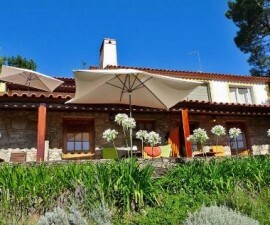 Away from the guesthouse there is a restaurant located in the village of Aldeia de Serra a short walk away, and plenty of choice a little further afield in the city of Tomar. Tomar’s historic sights and those of Fátima and the other major centres in the region are all with easy reach by car. If you are looking for a large house in a pretty location that won’t break your budget, Casa do Trovador makes an ideal choice. 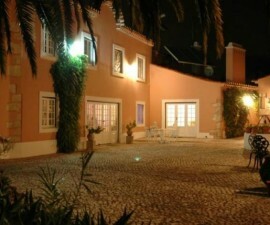 Address:	São Gião – direção estrada das Barreiras.